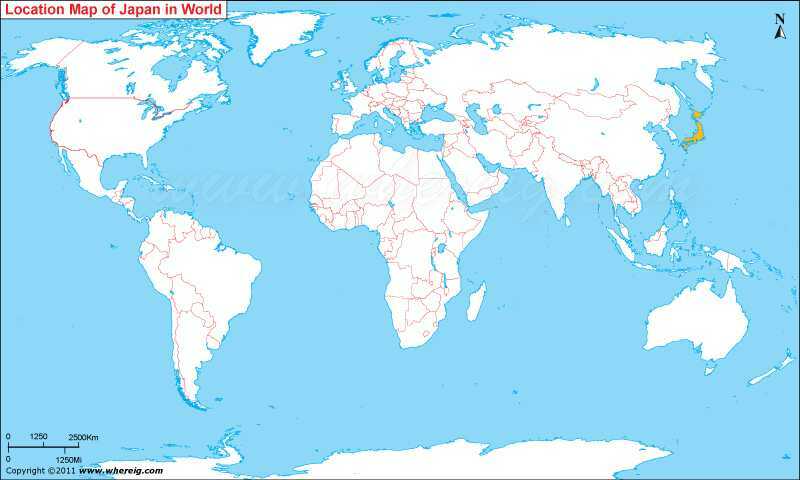 The Map showing where is Japan located on the world map. Japan is located in the far east of Asia continent. It is a group of islands nation located in the Pacific Ocean. Japan Sea lies east of Japan that separates from Russia, China and Korean Peninsula. In the south east China Sea lies. In north, La Perouse Strait separates Japan from Sakhalin, Russia and Korea Strait separates Japan from South Korea in the south west. Interestingly, Japan name is not given randomly rather it has some meaning i.e. "sun-origin". This is why Japan has sobriquet i.e. "Land of the Rising Sun". Surprisingly, Japan is an archipelago of about 6,850 islands. However, among them four are the largest main islands that constitute about the 97% part of the country i.e. Honshu, Hokkaido, Kyushu, and Shikoku. Most of the islands of Japan have mountainous terrain and there are many volcanic mountain peaks. The highest mountain peak of Japan is Mount Fuji, which is a volcanic peak. Though, in terms of area, Japan is quite small but in terms of population Japan is the world's tenth-largest populated country with more than 127 million people. The Greater Tokyo region, which is the capital city of Japan incorporates some the peripheral area and together constitutes world's largest metropolitan area. Japan has maintained a unitary constitutional monarchy with an emperor and an elected parliament called the Diet. Japan has the world's third-largest economy in terms of purchasing power parity. Not only this, Japan is also the world's fifth largest importer and fourth largest exporter. Though, Japan willingly gave up its right to declare a war; nevertheless, it has quite modern and extensive military force for self-defense and peacekeeping purpose. As per WHO report Japan has the highest life expectancy and the third lowest infant mortality rate in the world. Since more than 80 percent of Japan is mountainous; hence it is unsuitable for agricultural, industrial, or even residential use. Besides, the islands of Japan are located in a volcanic zone on the Pacific Ring of Fire. There are steep elevations, diverse climate and high risk of landslides more often induced by earthquakes and heavy rain. Probably, this the reason that the habitable zones mainly concentrated in coastal areas, where population density is very high.